Rebecca Adams married Abijah Houghton, son of Edward Houghton and Abigail McCoy, in Oct 17, 1768 at Woodstock, Windham Co., CT, USA, Bosley: "Before my mother died she wrote a letter to the town clerk of Woodstock, Conn. asking for a copy of the marriage record of Elijah Houghton and Rebekah Adams in Woodstock, Conn. She received back a photocopy of "Woodstock Vital Records" stating "Elijah Holton of Killingly & Rebecca Adams of Woodstock were Married October 17th 1770 by the Rev. Abel Stiles Pastor"; MLM: Sherburne, MA; VanNoy: Nov. 17. Sarah Abbott married Jonas Houghton, son of Edward Houghton and Abigail McCoy, in Nov 29, 1768 at Union, Tolland, VT, USA, VanNoy: 24 Jan 1768. Joseph Houghton married Ame Haskell in Sep 26, 1751 at Harvard, Worcester Co., MA, USA, Joseph of Harvard and Ame (Ruhamah int.) of Bolton. Joseph Houghton married Martha Snow, daughter of John Snow and Hannah Sawyer, in 1762. F, #3965, b. circa 1738? 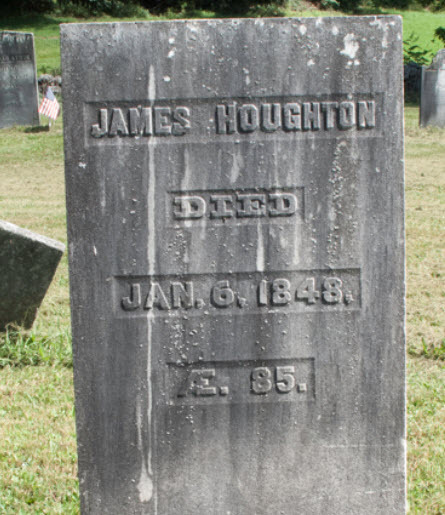 James Houghton married Elizabeth Stowell in Jan 6, 1789 at Petersham, Worcester Co., MA, USA, Stowell Gen., MLM: Mg. int., Petersham, Jan. 21, 1790. Major Edward Houghton Jr married Ruth Bridgeman MLM: ca. 1770. Major Edward Houghton Jr married Mrs. Mary A. Taggart in Jun 11, 1834 at Colrain, Franklin Co., MA, USA. Capt. Levi Houghton married Hannah Dimick in May 10, 1798 at Petersham, Worcester Co., MA, USA. Richardson Houghton married Rectina Field in Dec 3, 1795 at Deerfield, MA, USA, VT Gazetteer Index: v. pt. 3, 78: VT.
Elizabeth Stowell married James Houghton, son of Lieut. Edward Houghton and Lucretia Richardson, in Jan 6, 1789 at Petersham, Worcester Co., MA, USA, Stowell Gen., MLM: Mg. int., Petersham, Jan. 21, 1790. Ruth Bridgeman married Major Edward Houghton Jr, son of Lieut. Edward Houghton and Lucretia Richardson, MLM: ca. 1770. Mrs. Mary A. Taggart married Major Edward Houghton Jr, son of Lieut. Edward Houghton and Lucretia Richardson, in Jun 11, 1834 at Colrain, Franklin Co., MA, USA. Rectina Field married Richardson Houghton, son of Lieut. Edward Houghton and Lucretia Richardson, in Dec 3, 1795 at Deerfield, MA, USA, VT Gazetteer Index: v. pt. 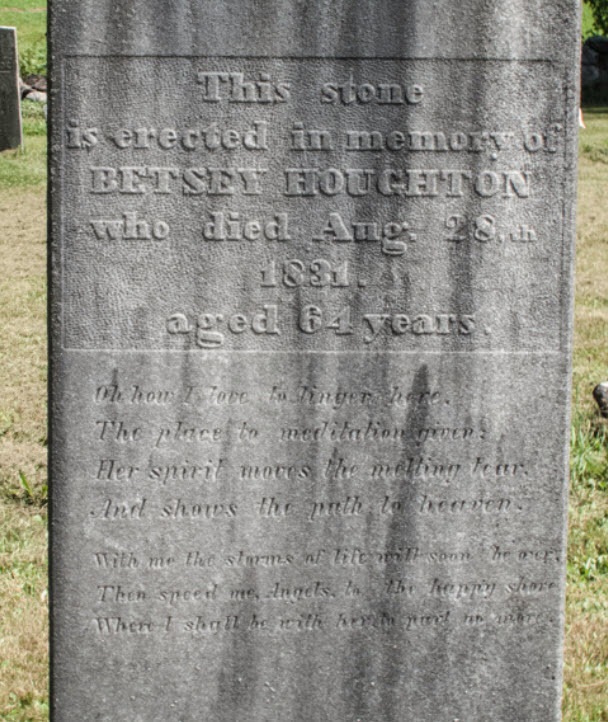 3, 78: VT.
Amy Houghton married (?) Sawyer. Molly Houghton married Jacob Cadwell. Susan Houghton married W. Wood. Major Levi Houghton Jr married Elizabeth Stearns in Jan 3, 1803 Watertown Gen., Stearns: Jan 13. Major Levi Houghton Jr and Abigail Greenleaf declared their intentions of marriage on Sep 19, 1830 Shirley, Middlesex Co., MA, USA. Major Levi Houghton Jr married Abigail Greenleaf in Oct 15, 1830 at Shirley, Middlesex Co., MA, USA, Bolton & Shirley VRs: dup. Nov 4; MLM: gives this marriage for Maj. Levi Houghton, son of Edward4, Jas.3-2, Ralph1. Major Levi Houghton Jr married Phoebe Shattuck, daughter of Ebenezer Lakin Shattuck and Hannah Tarbell, in Apr 20, 1845. Samuel Houghton married Frances Adams in May 30, 1802. (?) Sawyer married Amy Houghton, daughter of Levi Houghton and Anna Richardson. 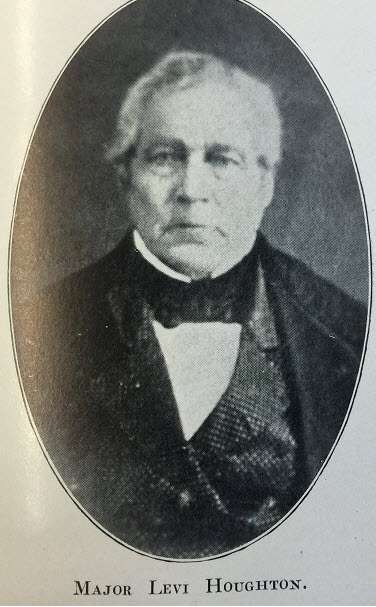 Jacob Cadwell married Molly Houghton, daughter of Levi Houghton and Anna Richardson. W. Wood married Susan Houghton, daughter of Levi Houghton and Anna Richardson. (?) Wood married Thomas Pratt. Thomas Pratt married (?) Wood, daughter of W. Wood and Susan Houghton. Elizabeth Stearns married Major Levi Houghton Jr, son of Levi Houghton and Anna Richardson, in Jan 3, 1803 Watertown Gen., Stearns: Jan 13. Frances Adams married Samuel Houghton, son of Levi Houghton and Anna Richardson, in May 30, 1802. Frances Adams Houghton and Hon. Ebenezer Torrey A.M. declared their intentions of marriage on Oct 27, 1825 Fitchburg, MA, USA. Frances Adams Houghton married Hon. Ebenezer Torrey A.M. in Nov 14, 1825 at Fitchburg, MA, USA, Stearnes, MA Marriage Index: circa 17 Dec 1825.